Alcare and Silverfang goes to the beach, but hey! she forgot again the umbrela, so Alcare guess the worst: He'll use again him wing-unmbrelas. (Reason #45 for have a winged mate). Alcare and Silverfang © their Players. 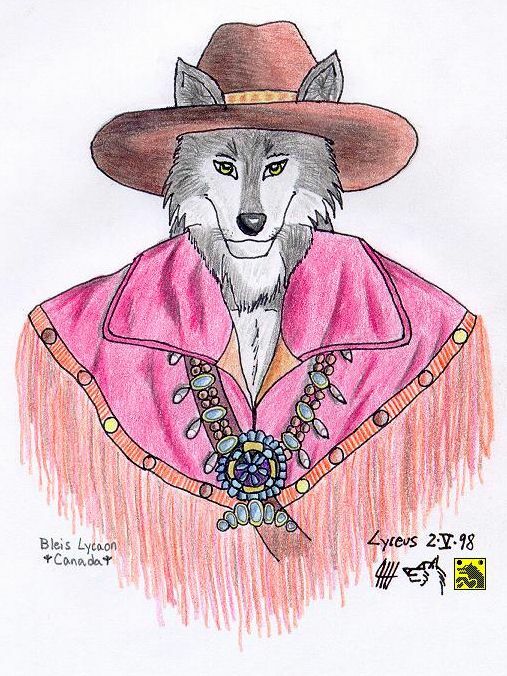 Art © 1999 Lobocursor Lyceus. Stlye: Ink/Photoshop/Bryce 2. 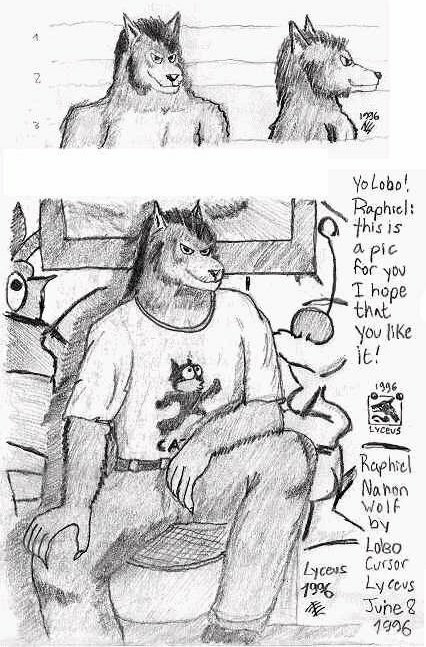 The shadow of the alien Part #1, Fax wolf (right) shows to me (left) and Moonchild (top) one nice friend of him. 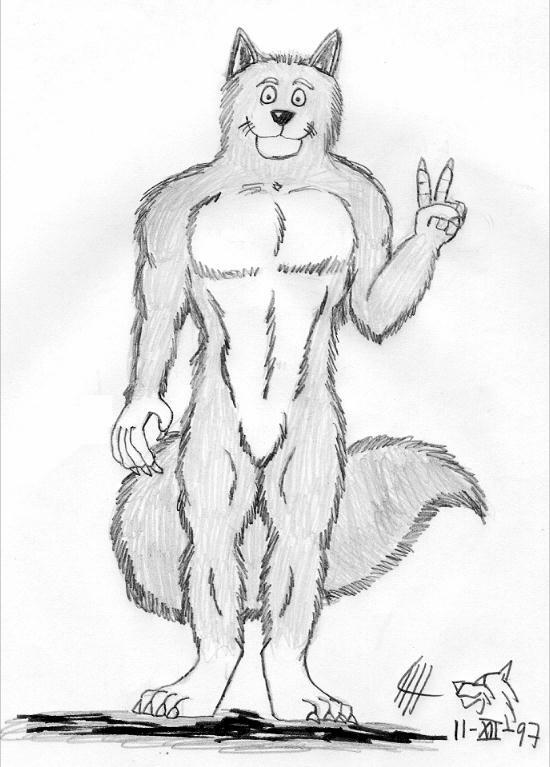 This is the first time that I draw a picture of my furry/were alter ego. This is a pic of a friend of Canada: Bleis Lycaon or Freki. *hugs* Style: Pencil, ink and color pencils. May 98. 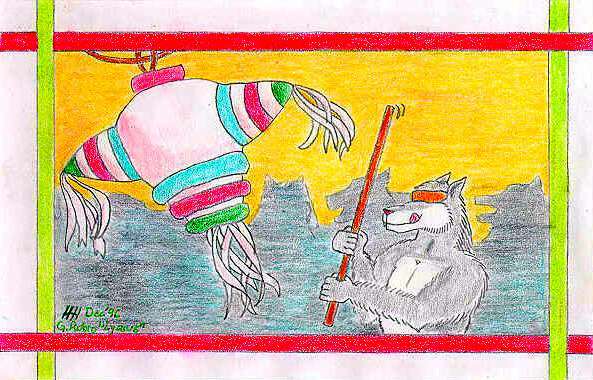 This is from an old aztec codex: the 2-coyote day. 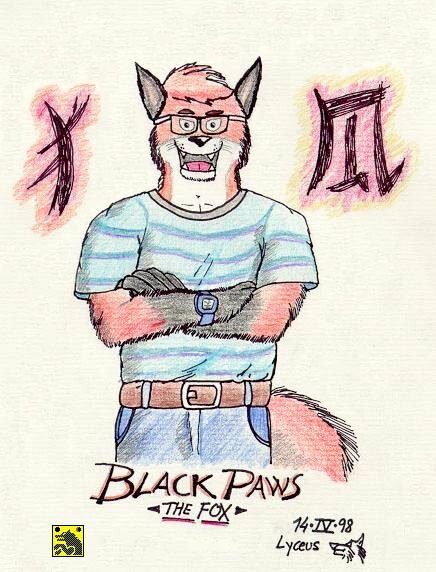 It means a wolf/coyote, wolf/coyote shaman, and a werewolf/werecoyote. 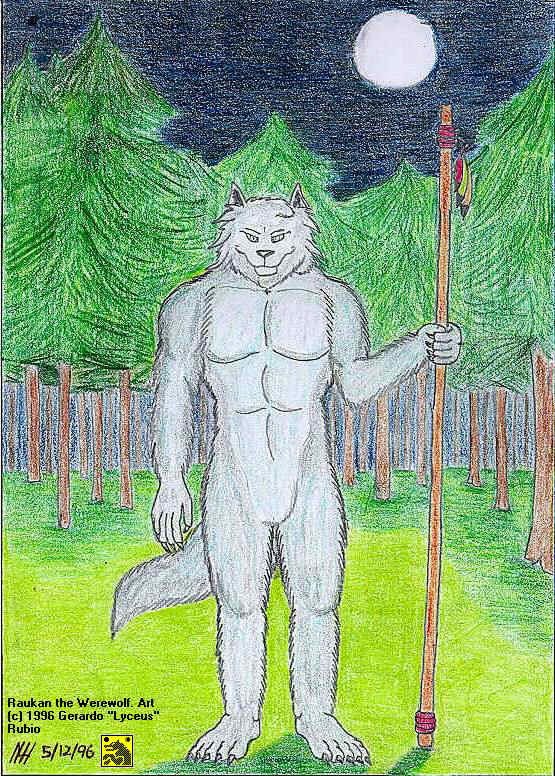 A picture from 1994, A granya (werehuman-dragon) of Mistere The Earth Blues series. 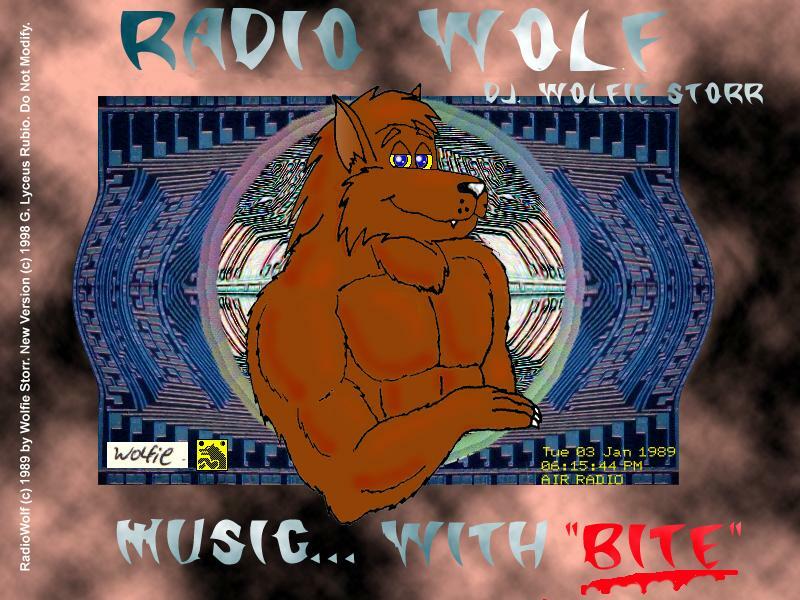 Happywolf is drinking a cool juice at the CFE9. Sorry the delay, Happywolf! 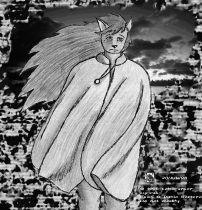 Happywolf © his player. 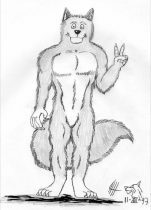 Artwork © 1998 G. Lyceus Rubio. Style:Ink, FaberCastle Colors and IRIX Showcase. A jaguar from a mayan codex. The jaguar looks very human - see his legs -. I use some fake colors that do not match with the original codex. From a mayan codex a human-like and a normal jaguar representation. For the cloth maybe is shaman or a good of mayan day. Keith the Panther in the serach of his mate across multiple astral planes. Keith © Pablo Romero. - C05. Style: Pencil & Ink, background done in Photoshop. Frnkzk shows off at the beach. I just used my new camera Lyceus Film 35 *grin* - Frnkzk (C) his player. This is a puma-morph for the main page of my Unievrsity Web (also my second try to made a cat!). 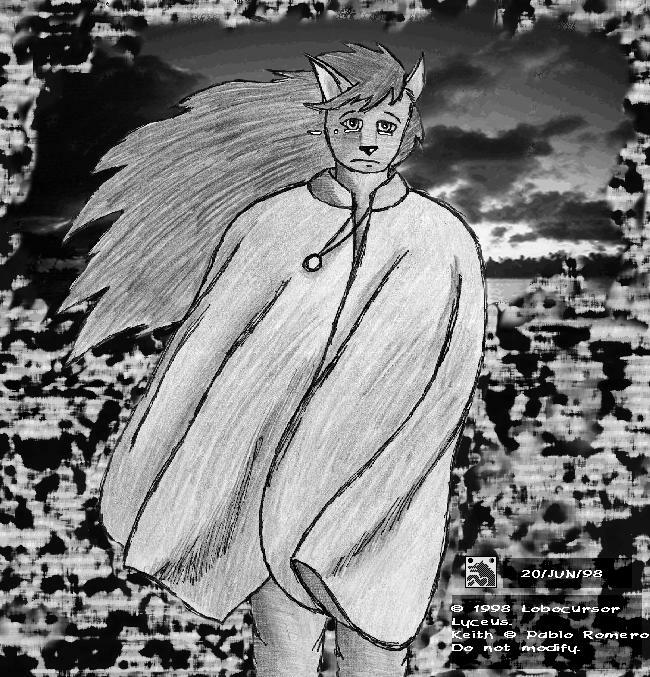 Art by Gerardo "Lyceus" Rubio. © 1997 National Autonomous Univeristy of Mexico, Acatlan Campus. 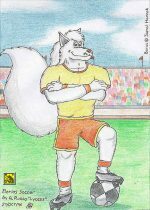 My last pic posted on 1997, Malvor a dear wolf from Australia. *sigh* I hope next year I could have less troubles and can post more pics. 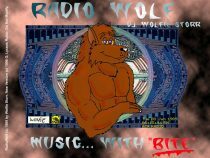 A new version of RadioWolf! 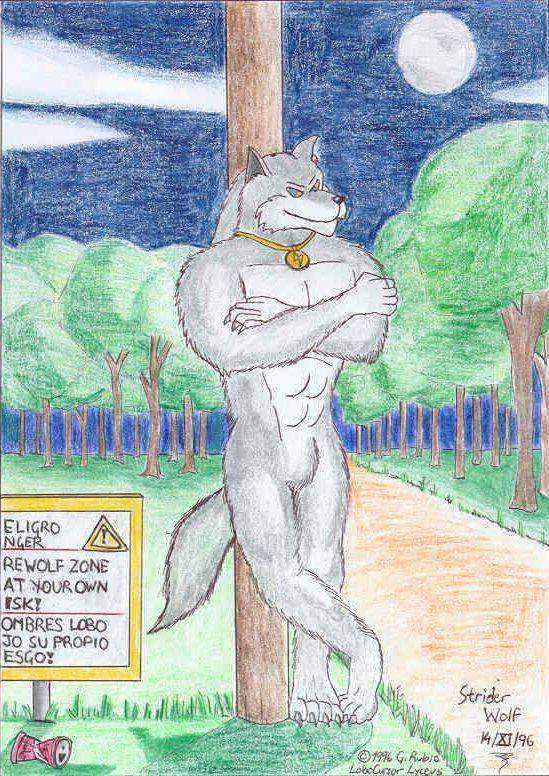 So I still like the original pic who Wolfie Storr did made. Wolfie Storr (C) P. Sims Style: Photoshop. Dedicated to the 5 fans of my art (NO kidding!). Raphiel Werewolf poses for the camera, also some views of his head. Raphiel © Kaupin. 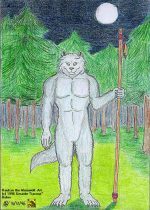 A commission for Raukan, he looks at you and welcomes to him territory. A new model of Terminators (tm): Cyber Taz2000. He has done with all the work of the night and he's ready for the next work. This is my first Photoshop picture. Pheww! 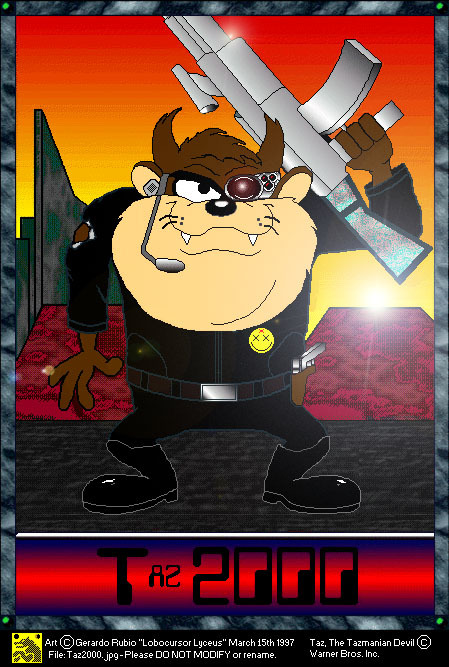 Taz devil © Warner Bros. The BEERwolf! 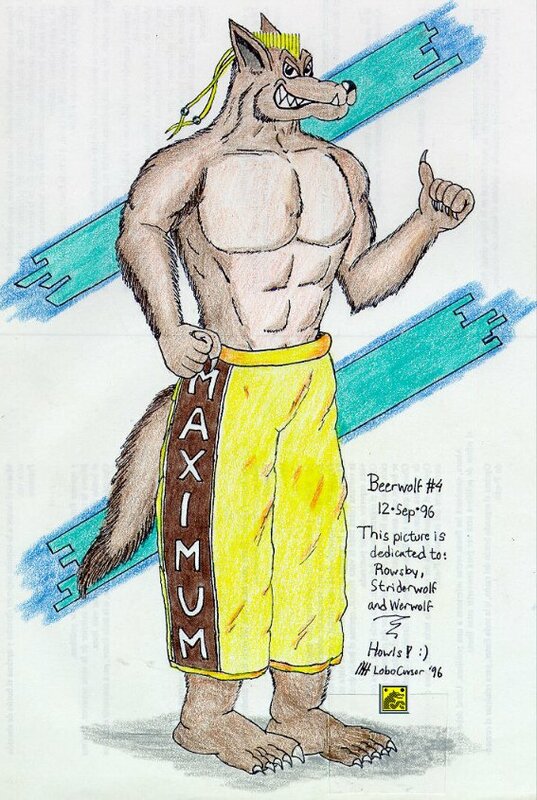 : Haxs "Beerwolf" Lyceus is surfing on a beer can, put there your favorite brand! 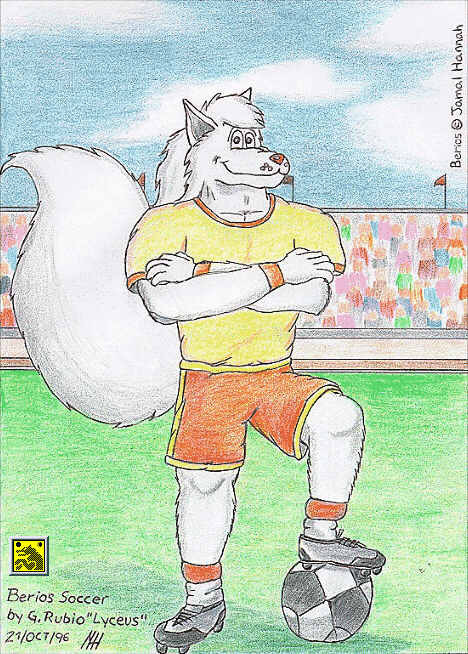 Haxs "Beerwolf" dressed like his favorite Street Fighter II character: Deejay. Other pic of the Beerwolf! 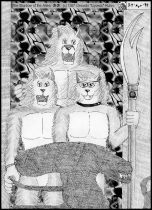 Now we take a funny beer break on the pyriamid with "Anubis Beerwolf" *grin* From left to right: Edolus Lyceus (me), Beerwolf and Wolfie Storr. 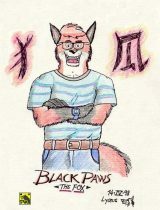 This pic belongs to the Mistere IV chapter: "Anubis Beerwolf". 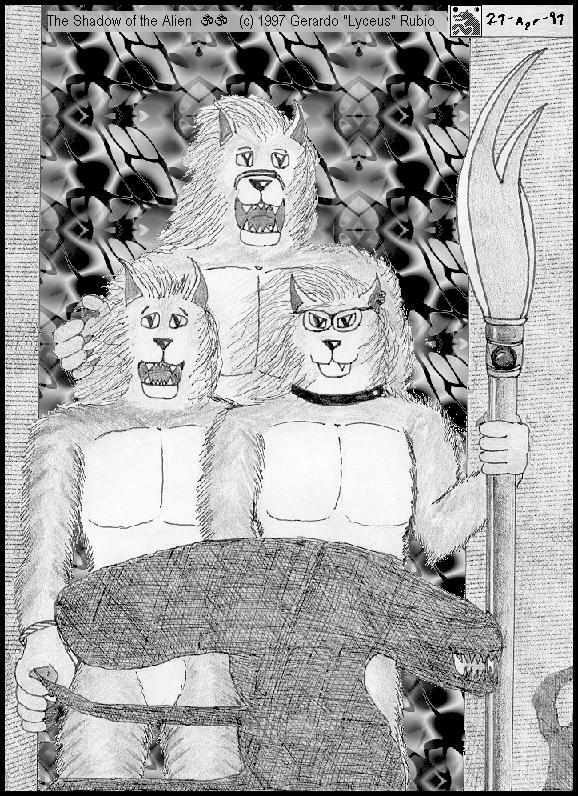 A Xmas werewolf card for all my friends, this is the public release without greetings and other stuff. 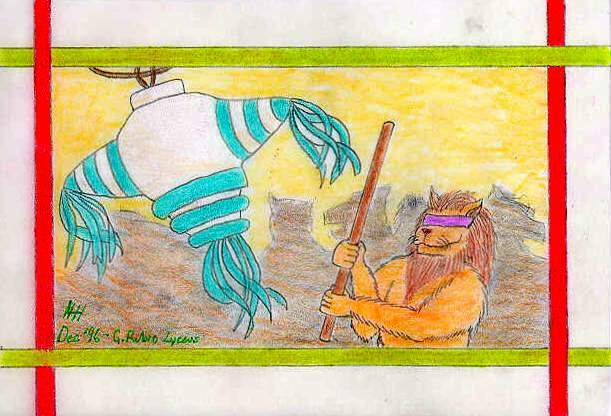 A Xmas werelion card for all my friends, this is the public release without greetings and other stuff.